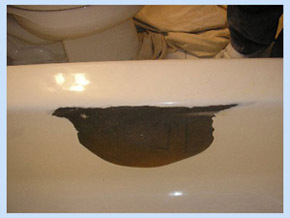 Chip Repair is a process allows a technician to repair a chipped bathtub. The key to the process is color matching and actual body work. PBRA members are expert at matching colors and making repairs. The same process can also be used sinks, tiles, antique claw foot bathtubs. Just about any hard surface can be made to look new again. Our products are specifically designed for refinishing. 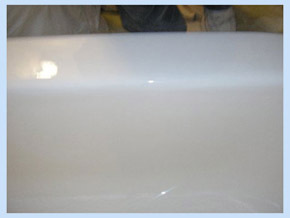 Our process of bonding the new glaze to the existing bathtub was specifically designed to promote optimal adhesion and longevity. The key to a long lasting surface is preparation. PBRA members take the time to properly prepare the surface to be refinished, using only the best quality products. There are many options available to you the consumer. However, be aware that imitation do-it-yourself kits and refinishers who offer super low prices are because important preparation steps are skipped and cheap products are being used. PBRA members take pride in the services they offer and with proper care and maintenance stand behind their products 100%. The refinishing process generally takes between four to five hours. The bathtub is ready for use the very next day. 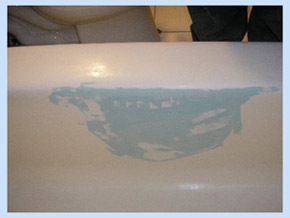 If your already saving 80 % versus replacement it only makes economic sense to have a professional refinish your tub. There can be no compromise on materials, procedure, or equipment. This will cost a few dollars more but you will be happy with the results.